Reading is such an important activity to do with your babies and children. It helps to develop vocabulary and speaking skills and also fosters a love of reading from a very young age. As a teacher, it is quite obvious which students have been read to from a young age. 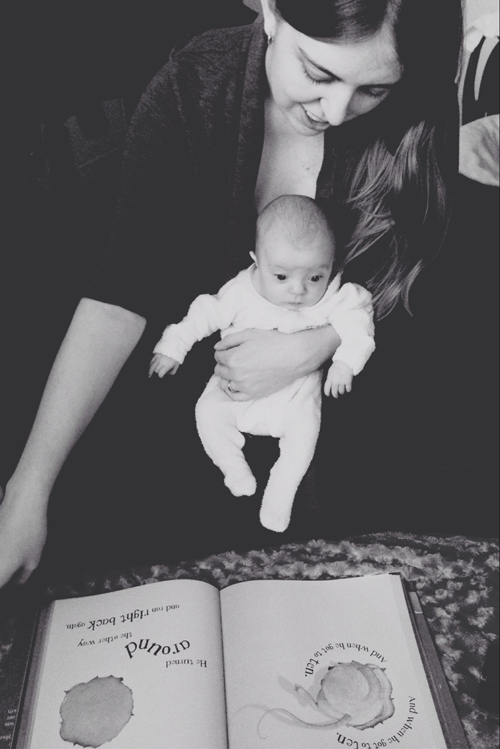 Even though it feels kind of silly, I believe it's important to start reading to the youngest of babies. I can remember one particular day when Lilly was 8 weeks old. She was fussing and whinging a lot so I sat down and read to her - she instantly cheered up! My husband took a photograph of us together and it is one of my favourite photographs now. 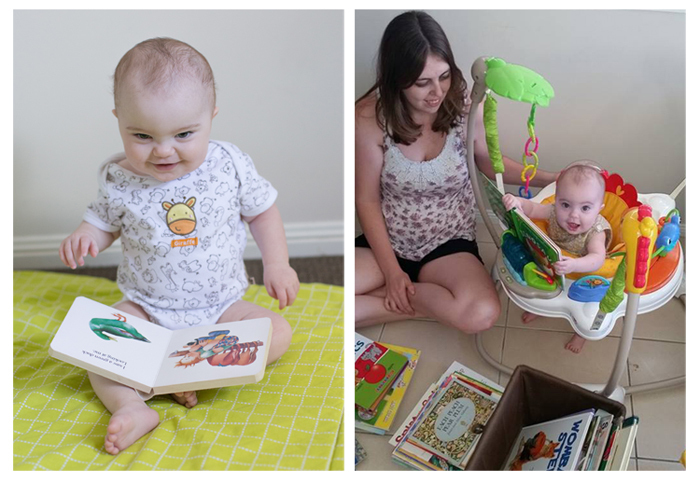 So today I thought I would share some of our favourite books to read together at 9 months old! We started to incorporate books into a bedtime routine but found that normal picture books were a bit tough with Lilly and her busy hands. We now read mostly board books which is what I want to share with you today. At the moment, Lilly is loving books with a sensory element to them - anything she can feel with her hands is a winner! We absolutely love reading the Hungry Caterpillar playbook and the dinosaur story book. The Hungry Caterpillar book is SO MUCH FUN! Lilly loves feeling the lion's mane. I looked everywhere for the 'Guess how much I love you?' board book as it was a favourite of mine as a child. I often like to read this one at night time. It has such a sweet storyline and I remember my mum and sister often saying "I love you THIS much!" 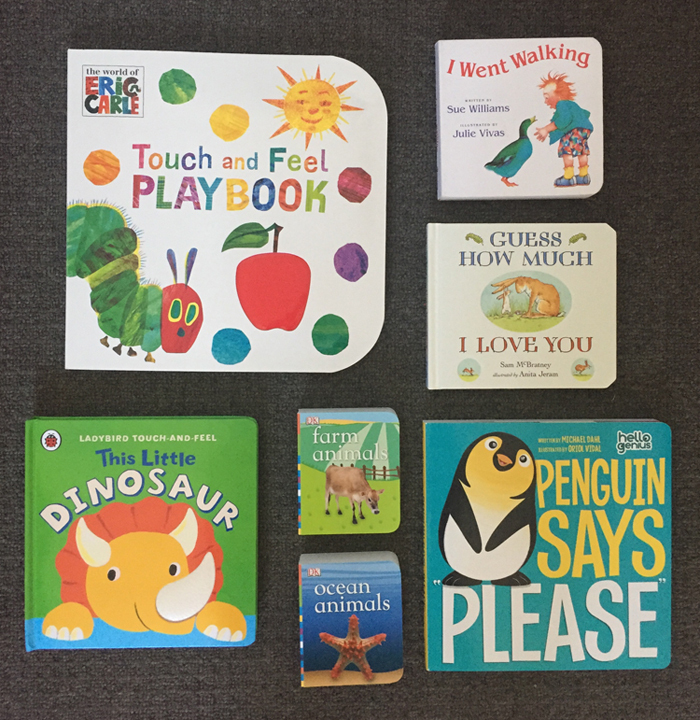 The farm animal and ocean animal books were part of a big vocabulary pack that I found at Big W and are perfect for little ones who are learning to talk. 'I went walking' is a repetitive book that is commonly used in Prep and Kindergarten which I absolutely love because it builds animal and colour vocabulary. So why is it important to read to your children lots and build up their vocabulary? It's a very well known fact that the brain develops most in the first 5 years of a child's life. Exposing babies and children to a wide variety of words in these early years will help develop important literacy skills down the track. Here is a fantastic article about building vocabulary with your little ones.